What would it cost to replace Pilgrim Nuclear Plant with Solar PV? 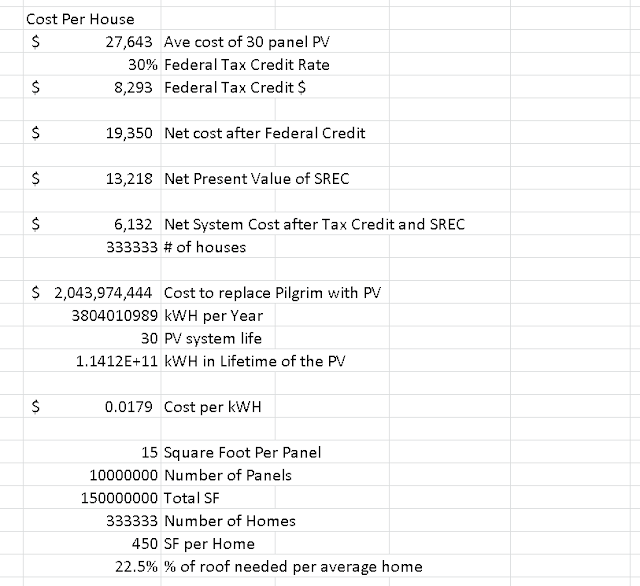 Then we look at what the cost per kWH would be to the PV owner. Actually let me give you all the answers, and then you can review the calculations below. Here is the link to the load factor data. The person who spurred me on to this had these incredulous statistics at his website. Steel: 450 thousand tonnes; that's 0.6% of our U.S. total annual production, JUST TO REPLACE ONE SMALLISH PLANT. Land: about 190 square kilometers (14 x 14 km); that's 73 square miles, larger than the District of Columbia, JUST TO REPLACE ONE SMALLISH PLANT. 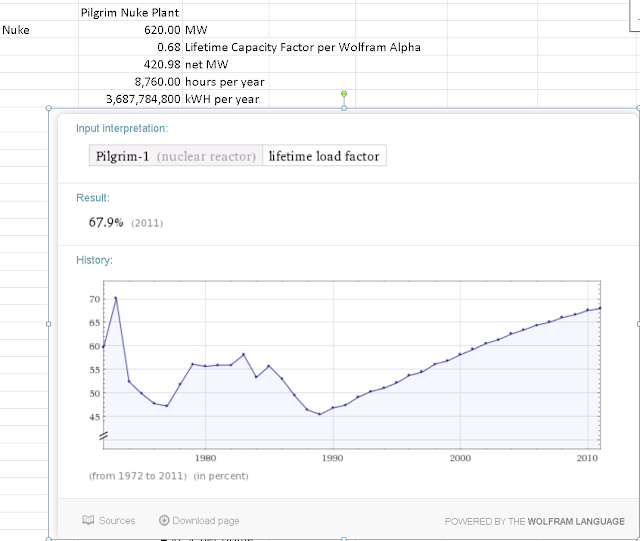 One thing you should check in your calculations is the lifetime average load factor. It is really not representative any longer, with industry average load factors up at 90%, including both Pilgrim and Indian Point, despite recent performance problems. You will still find that solar can replace nuclear generation cost-effectively at this point -- both in terms of total generation and derated capacity -- particularly when the merit order effect on market prices is factored in, bringing down average wholesale and peak electricity prices. 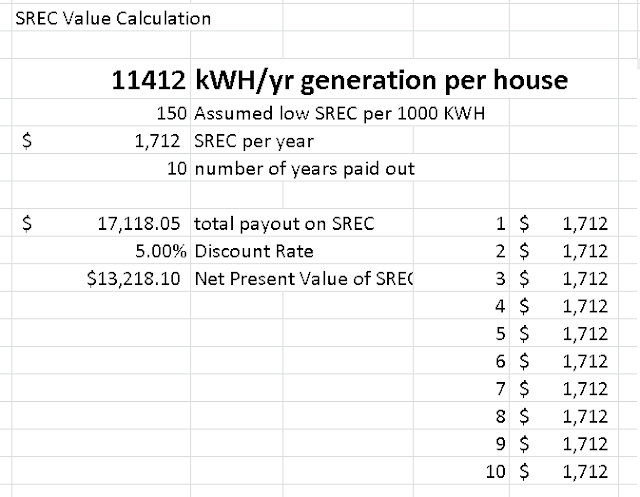 However, a better way to look at it is including a mix of generation resources, including a combination of efficiency, wind, demand response, storage, etc., all of which (except storage at this point) are even cheaper than solar. Extending that out to a system-wide model, you would find that both fossil fuel and nuclear generation could be replaced with clean energy resources, cost-effectively. Thanks for the input, I did look at current and lifetime, and choose to use the lifetime. 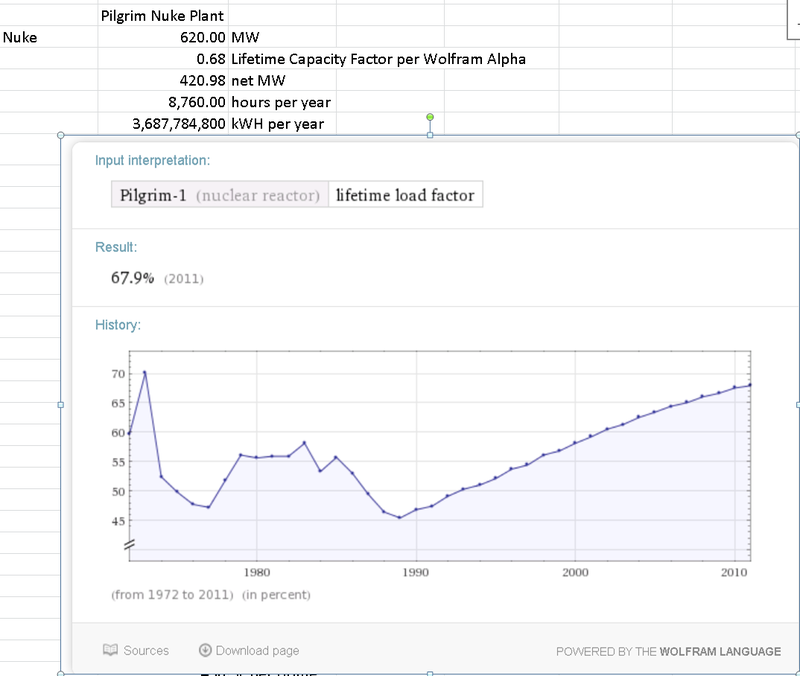 I guess one justification is that solar is only going to get better, just as nuclear "got better" at not shutting down. TPTB don't like solar - it's distributed and you can't use it for weapons. It's not a technological problem, it's a political problem. Indeed, you nailed it. I have seen this in Hawaii, PV became so sucessful that the "dear leaders" realized they were losing one element of control over the populace. These sociopaths wake up in the morning and think about how they can maintain control over the peoples. Another stoopid Microsoft Excel treatise. How much real estate does the equiv. PV cost? Include capacity factor. Sorry loose cannon, you are toast.